Rioja news from the island of Orkney: Highland Park Distillery has announced the release of their very first Spanish Rioja wine cask matured single malt: Twisted Tattoo. Casks have a major influence on the flavour of whisky, driving both natural colour and distinctive character through the cask wood and its seasoning. 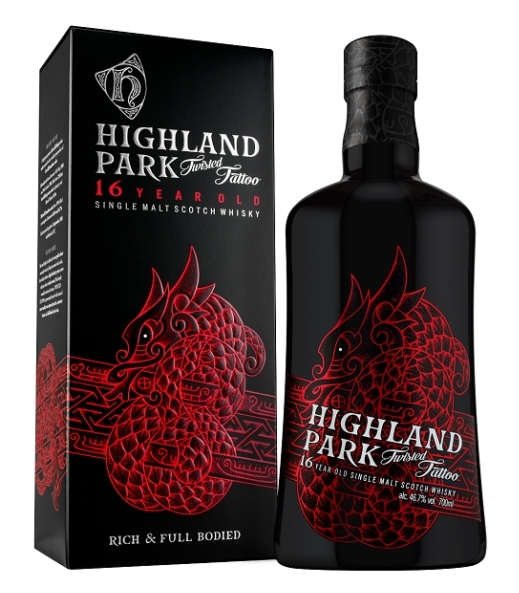 Although Highland Park whisky is traditionally matured in sherry-seasoned oak casks, for the 16 year old Twisted Tattoo bourbon casks were used, but this time combined with a high percentage of casks seasoned with rich and full-bodied Spanish Rioja wine. Highland Park’s Master Whisky Maker, Gordon Motion, created Twisted Tattoo by combining 153 oak casks seasoned with Spanish Rioja wine with whisky matured in 70 first-fill bourbon casks. Filtered at 4°C and bottled at 46.7% for rich and full-bodied flavour, Twisted Tattoo is rounded, sweet and creamy. Layered with notes of sweet vanilla, sun-ripened peaches, summer berries, red wine and Highland Park’s trademark aromatic peat smoke, this single malt delivers its own distinctive twist on Highland Park. The suggested retail price of Highland Park Twisted Tattoo is £80.00 for a 70cl bottle.